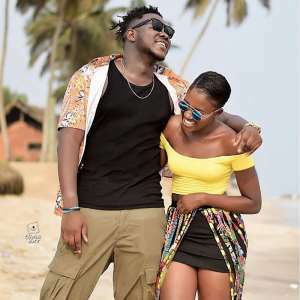 Ghanaian rapper Samuel Adu-Frimpong known in showbiz as Medikal, has revealed that the phrase 'Aboa wo to nono' was inspired by his actress girlfriend, Fella Makafui. "'Aboa wo to nono' was inspired by my girlfriend Fella Makafui due to her backside," he revealed. Medikal, in an interview, expressed how his life, money, cars, girlfriend and other personal things inspire some of his songs. The 'Ayeko' hitmaker recalled how the fat backside of his girlfriend came to mind when recording the 'Wrowroho' song. Medikal further noted that his 'Ayeko' song which he featured King Promise on was also composed with inspiration from Fella Makafui. The AMG Business rapper explained that he composed the song for Fella Makafui. Medikal further debunked rumors that he brags in some of his music especially when he talks about money and cars. The rapper revealed that he has the cars and money he talks about in his music, thus will not talk about things he does not have.